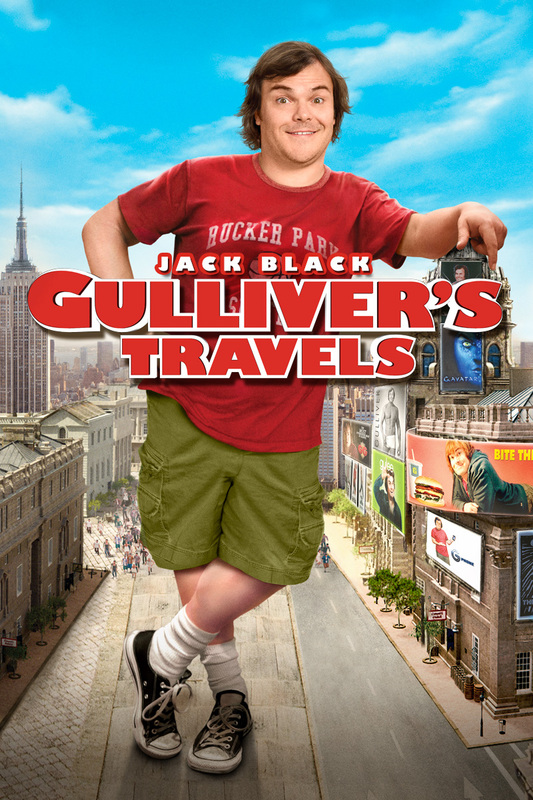 So, as the title says, I rented the 2010 adventure comedy, Gulliver’s Travels, with Jack Black. Now as forewarning, I went into this completely in the dark, as I had heard of the story, but never had read it or seen anything previous to it. I don’t think it’s really needed, as the movie is pretty self-explanatory. It’s basically Jack Black being Jack Black but named Gulliver, except instead of having fame in movies and music, it’s as if he’s just an office clerk working in the mailroom. For the most part it’s not a great movie; it’s certainly not the worst, but rather it’s on the mediocre side of bad. The movie suffers from a lack of humorous writing. They try, especially with Jack’s usual style of comedy, but very few jokes are legitimately funny. Most of them just fall flat, because of how obvious they are. I know Jack can do awesome comedy, as I loved Tenacious D and the Pick Of Destiny, because the jokes are funny, and they work for the story and premise of the movie. This one, while the movie’s humor falls flat, the rest of the story seems fine. If they had made it more serious tone, or at least had better humor, it would’ve been a better, overall enjoyable movie experience. The rest of the movie seems fine, the plot and premise seem to work (for what I’m guessing) is the original story of Gulliver. Everyone but Jack Black seems to fit within the parameter’s of the story. The problem with having Jack in an adapted story, is that the writer’s have to find jokes that make sense as per the character and the actor’s portrayal, especially when its made into a comedy. It’s not unwatchable. Anyone who likes Jack Black and enjoys that style of humor, which has been done before, and in a much better way. They will still probably enjoy this movie. I myself liked the story, it’s just the humor is where the movie suffers. Don’t get me wrong here, I love Jack Black as a comedic actor, it’s just the movie is a general sense of “Meh”. With the love interests and character development in the story, it works, as I can relate to Jack’s character in the movie. As I myself am not the most forward with women. The movie just needs more to it, to make it enjoyable to everyone. I enjoyed the other actor’s though, Siegel, while the humor is flat, the rest of his character arc works as a man who loves a woman outside his reach. The primary villain got better over time, he was rather droll and uninteresting earlier in the movie, but his arc to becoming more and more villainous was good, if done before. Despite some plot holes, it’s an ok experience. It just needs more humor. So without sounding like a broken record too much, I’ll sign off now. I’ll try to get the Total Recall remake review done at some point soon.